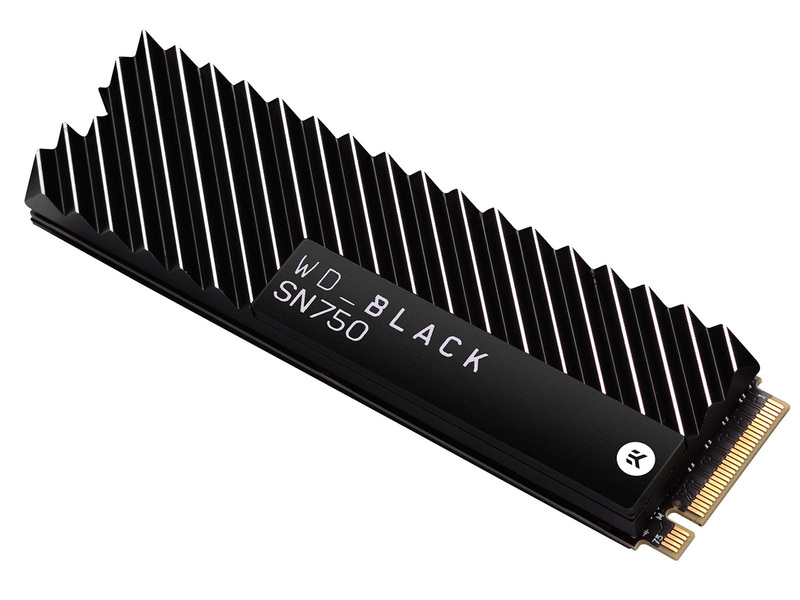 WD has made a concerted effort to get into the premium gaming storage arena with a range of high-performance PCIe x4 NVMe SSDs. The Black NVMe kicked off the speedy jamboree, hitting over 3GB/s read and almost the same as write. At MWC 2018, WD introduced the also-fast SN720, designed for, somewhat strangely, IoT devices. Those with their finger on the solid-state pulse may realise that WD is using the same hardware as the SN720, meaning an in-house-developed controller and 64-layer 3D TLC NAND. All we know about the controller is that it is fabricated on 28nm process and interfaces with the NAND via eight channels. Interestingly, buffering operations are done by DDR4 memory rather than LPDDR4, potentially resulting in a bit extra energy expenditure. Sequential and random speeds are pretty much in line with the best of the competition but the endurance is lower than we'd like. Corsair's Force Series MP510, for example, has almost 3x the claimed longevity. Should we read too much into it? Not really, as the 1TB model, in for review today, can be completely written 600 times over the course of its five-year warranty period. Anyone doing much more ought to look at workstation-specific drives. Pricing, too, is in line with drives such as the aforementioned MP510, the Samsung 970 Evo, and the Intel SSD 760. Do bear in mind that should value be more of a concern than sheer speed, the same 1TB capacity from the QLC-based Intel SSD 660p costs just £125. Like most, the SN750 is set to be available in the bumper 2TB capacity, albeit released at a later date to the rest. 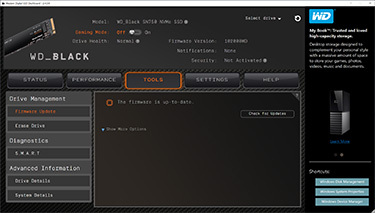 WD Black SN750 is presented in solely an M.2 2280 form factor. Makes sense once you consider the NVMe PCIe Gen 3 x4 interface and the number of supporting motherboards on the market. The 1TB drive itself contains the NAND and controller solely on one side. You might imagine that such an approach would cause a fast drive like this to potentially throttle, especially on motherboards that don't feature specific M.2 cooling. To that end, exactly the same drive will be made available with a pre-applied EKWB-designed heatsink, ostensibly to keep temperatures down in those instances. There's about a tenner premium over the bare drive for all capacities, and we ought to see these models surface in a couple of months' time. 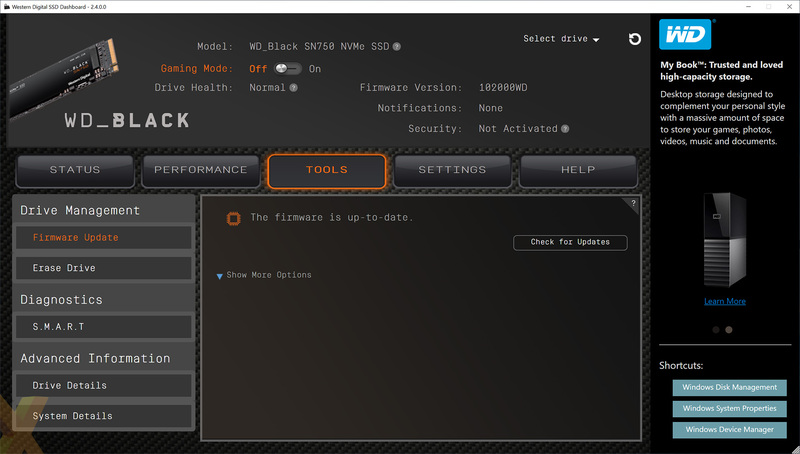 An interesting feature is the Game Mode feature baked into the SN750's firmware. 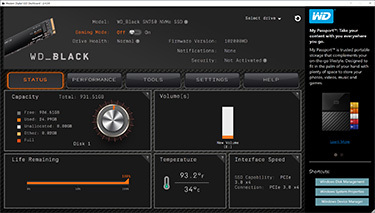 It's activated the via sleek-looking WD Black SSD Dashboard software (after a reboot, mind) and, from what we can gather, overrides the power-saving features present as standard. 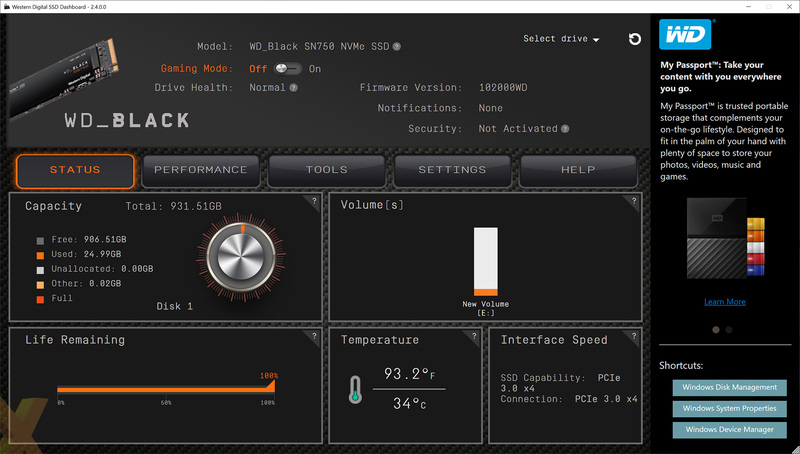 Doing so, WD claims, enables the SSD to run at peak performance at all times. WD recommends only using Game Mode with the upcoming heatsink-clad version of the SN750 - or, presumably, if your motherboard has the requisite heatsinks in place, as many do - though, as you will see later on in the review, performance doesn't go up by much at all. Here is said software that takes a rather long five seconds to load from a fresh boot. It's easy on the eye, intuitive, and has the key features we would expect, including general monitoring and the ability to sanitise and secure-erase, though with the requirement that you create a bootable USB disk for either function. WD also includes a branded version of Acronis True Image for simple migration and backup of data. Enough chatter, let's now see how quick the 1TB model is.